My thoughts: This book was absolutely stunning and positively gripping. It held my attention from the first page. The characters are a little odd - I'm not sure I could relate to them, but the plot was insanely good. I've struggled inwardly with whether procedures such as IVF are truly a good idea. I won't share my ultimate view points on that kind of thing here, but I will say that this author did a wonderful job in presenting reasons why it is and is not a good idea. That's not really what this book was about - I think this book really is whatever you want it to be. If you just want a really good book to read, this is it. If you want a book that links Biblical truths to everyday life in new ways, this is it. If you want a book that questions scientific procedures, this is it. 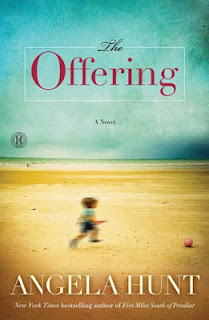 If you're not a fan of Christian fiction, no worries - this book probably technically is, but you won't notice it reading it if you're not a Christian. I really think this book would be great for any woman, but perhaps particularly so for mothers. I was such a fan of the preacher's epiphany of sorts that Mary was a surrogate when carrying Jesus. What a profound truth. That blew me away. There are so many good parts to this book - I don't want to name them all. I'd rather you check out this book for yourself! This is one of the best books I've read all year.